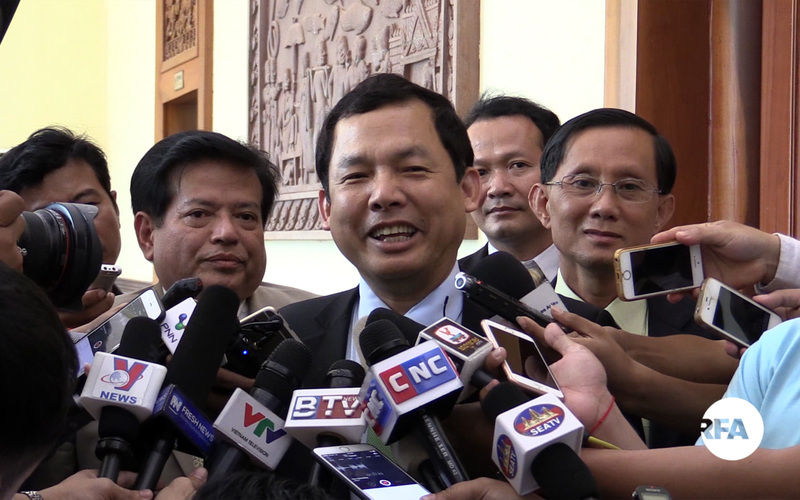 CNRP Lawmaker Eng Chhai Eang speaks to reporters after a meeting at the Ministry of Interior in Phnom Penh, March 29, 2017. Cambodia’s government has no objections to the results of an extraordinary congress held by the opposition Cambodia National Rescue Party (CNRP) earlier this month to appoint new leadership, the CNRP said Wednesday. However, the country’s Ministry of Interior appeared to contradict the claim, saying the CNRP would be held to existing by-laws it was found in violation of last week and making no mention of the ministry’s stance on the March 2 extraordinary congress. Regarding any other issues of contention between the opposition party and the Ministry of Interior, “the CNRP will find an appropriate solution,” the statement said. The CNRP convened its extraordinary congress to amend articles 45 and 47 of its party by-laws—removing an 18-month moratorium on appointing a new president and changing the structure of the party’s leadership. The congress also saw Kem Sokha named president, while Mu Sochua, Pol Ham and Eng Chhay Eang were made party deputies. On March 22, the Ministry of Interior ruled in a letter to the CNRP that the party had violated its own by-laws by holding the congress and appointing Kem Sokha, based on documents filed at the CNRP’s launch in May 2013. The announcement threw the CNRP’s political legitimacy into question ahead of local commune elections in June. Opposition officials contend that the CNRP was compelled to convene the congress and amend its statute before a new ruling party-initiated law on political parties went into effect, or risk being dissolved, because the law only provided it with 90 days to elect new leadership. Former CNRP president Sam Rainsy resigned on Feb. 11 in order to preserve the party in the face of the new law that also bars anyone convicted of a crime from holding the top offices in a political party, among other changes. After Wednesday’s meeting, Eng Chhai Eang told reporters that the Ministry of Interior had urged the CNRP to comply with last week’s letter, informing the party that it had violated its by-laws. The letter also called on the CNRP to dump its campaign slogan of “replace the commune chiefs who serve the party with commune chiefs who serve the people,” saying the phrase goes against election laws and the spirit of democracy. The CNRP has said it won’t modify the motto and will permit party activists to use it while campaigning for commune elections slated for June 4. Eng Chhai Eang said no further meetings will be held between the Ministry of Interior and the CNRP regarding the results of the opposition’s extraordinary congress. Statements by the CNRP appeared to contradict those made by Prak Sam Oeun while speaking with the media outside the Ministry of Interior at the conclusion of Wednesday’s meeting. The director-general told reporters that the ministry will be “keeping an eye on the CNRP” to ensure the party’s compliance with its by-laws and made no mention of its stance on the opposition’s extraordinary congress or amendments to articles 45 and 47. “We are certainly guided by the laws and there are steps to address this issue,” Prak Sam Oeun said. He did not elaborate on what was discussed at the meeting or what consequences the opposition party might face if found to have disregarded the ministry’s letter of last week. Reported by Moniroth Morm for RFA’s Khmer Service. Translated by Nareth Muong. Written in English by Joshua Lipes. Anyone who has dealt with the Ministry of Interior as I have over many years will see this move as typical of the authoritarian control mentality. This is precisely what applies and will apply more for other laws such as the ones regulating NGOs and Trade Unions. I recall one incident where my local NGO had informed the MoI of a change in the Chairman of the Board of the NGO - hand-delivered and sent by registered post. The MoI official ruled that as the MoI had not explicitly approved the change in writing, it was not valid. I did discuss this with top officials who promised to investigate and other issues, but nothing more was heard. I also made the point that while Cambodia chose to operate with a partial political party-based administration - instead of a neutral professional civil service - it would always fail to satisfy principles of natural justice in such matters.